Corrects an issue with credit card Pre-Authorization. Makes the Close Window button on trip bigger and moves it back to the same position as previous versions. LimoWiz 10.0.23 - Dec 14, 2009 - Critical Update. Account and Passenger Private and Ticket notes are now 100 characters long instead of 40. Callback notes and result fields are now 900 characters long instead of 300. Trip notes field is now 900 characters long instead of 300. Added account, passenger and contact phone numbers to emailed confirmations. New colored boxes for better readability and design. Program setup program now will detect if a Windows user is not administrator and will prompt of the administrator login to continue installation. This is necessary so that program components are installed and registered correctly under Windows. LimoWiz 10.0.22 - Dec 5, 2009 - Critical Update. 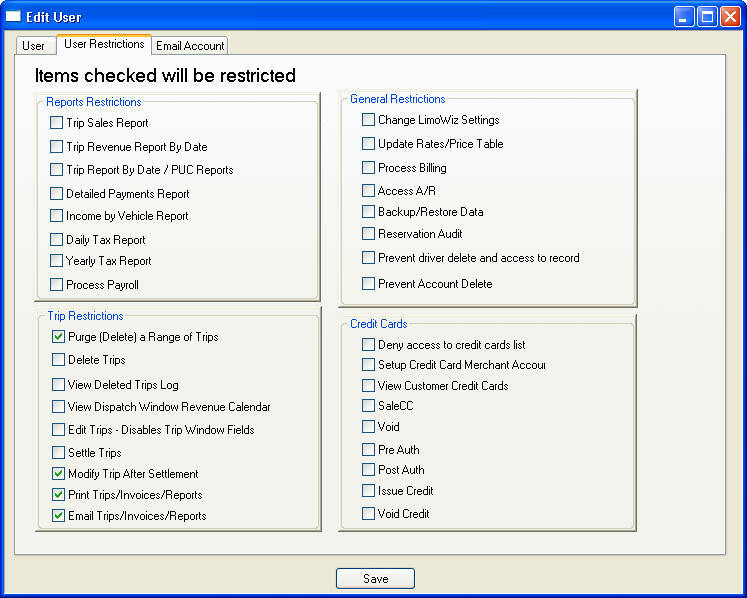 Addresses some issues credit card processing issues using MerchantWare Gateway. It also uses a new XML engine to parse the authorization result. Faster and more reliable. Updated various reports to fit the larger account number display. New Custom Trip Ticket...to print a note box that you can customize. Backup files name now include the time as part of the zip file name. Fixed an issue with saving account credit cards. Trips settled and paid now cannot be changed. A Red text will notify user of this fact. If a change is necessary, trip must be unsettled first using the Settle window by clearing the Settled By field, then click Save button. Fixes some issues on Trip Pay Window and Multi-Trip Pay window when using MerchantWare Gateway and improves the status window. Also handles international postal codes to avoid credit card decline. The Account Number field length has been increased from 10 to 15 characters. The credit card setup windows has been improved. If you are processing credit cards from LimoWiz, please make sure you select the correct credit card processing company that you are using. See File menu, Credit Account Setup, then Edit. THIS MUST BE DONE! Contains new Merchant Warehouse Gateway Interface for processing credit cards. All PDF documents documents created are saved in a sub folder in the limowiz2000 folder. If you using the network version, the PDF folder will be in the server. Introduced a new update method to insure data is updated when LimoWiz starts. Fixed an issue when you have a rated calculated based on mileage, the rate was changed to 0.00 if hourly was 0.00. Now rate is calculated correctly. Calculation of hourly charge after minimum fix. Improvements in credit card handling. Trip Numbers are now are 8 digits long to avoid conflict with the upcoming LimoWizOnline (web reservations). Flight Status link has been updated. It is free widget offered by FlightStat. Updated Trip Total printing on trip tickets. Now it print 2 decimal points instead of three. Update to include three (3) decimal digits for the tax rate percentage. For updates on this tax requirement, visit http://nystax.gov/ and do a search on the word limousine. Updated the Tax Report by Date to fix alignment of grand totals into proper columns on last page. Corrects an issue with expired LimoWiz license which few users experienced. This update adds a missing deposit line in HTML confirmations. This update corrects an issue with copy and paste of credit card numbers and some related issues. If you're using 9.9.5 and not experiencing this issue, there is no need to download this update. Corrects an error when tagged trip payment issue from multi-trip A/R window. Round trip was not carrying over credit card info. Now you will get a prompt. SMS Messages now include the day and date of the trip. New behavior: If you're adding a trip and you do not know which account a passenger belongs to, you can leave the account number blank, type the passenger last name in the Last Name field, then click the magnifier button (Zoom) next to it ; this displays the list of the passengers of all accounts. LimoWiz will do a quick search to the closest match. Click the correct passenger, then double click it or click the Select button to populate the trip window. The account number and passenger last name and first name will be filled in. The dispatch graph was truncating the times header. This is fixed, plus now you have the option to set the Days Ahead to process future days on the graph. Fixed an issue with rate calculation when hours and miles used together. Multi-trip pay via credit card not recording auth number and trans ID. This is fixed. All payroll reports have been updated to not print trips marked as paid on trip settle window. To force those trips to print, you need to click the Print Trips Marked as Paid. Fixed credit payment template. Was not printing correct names for PICK_NAME and DROP_NAME template fields. Luggage count was printing on SMS messages even when count was zero. Fixed. Other internal fixes and internal improvements. Makes LimoWiz Credit Card Standards compliant which set forth by credit card processing companies in encrypting credit card information and only storing needed information to process credit card from LimoWiz. If you use Authorize.NET gateway or PC Charge, you MUST download and install this update to ensure compliance with . LimoWiz will no longer store the credit card's Card Code (CVV 2) in anyway. The CVV 2 number is not required and it does not have any effect on the discount rates being charged. Enhances Multi-Trip Pay window. It now disables the non-credit card pay buttons if you're using PC Charge Pro or Authorize.NET and you select a credit card from the drop down list. Added "Optional" Credit Card Code field to single trip pay window and multi trip window. This code, as per PCI regulations, will NOT be saved. Removed "Expiration Date" from printed credit card receipts. NEW: Added new condensed multi-trip invoice to Billing window. It prints only the TOTAL DUE of the trip in charges column. NEW: Added MILES and MILES PER HOUR to trip charges on single and multi-tip invoices. NEW: Added option to Print account commission on trip charges on Single Trips invoices. To turn on this feature, see Settings, Billing tab, and click the Print Acct/Subco Commission on Single Trip Invoice. Fixed zero trip count zero that's printed on dispatch sheet report when one was listed. NEW: Hide Total Due on dispatch window restriction option added to user setup window. See Tools menu, LimoWiz User Setup. NEW: new mailing label report for the United Kingdom that A4 paper size. Paper size must be set to A4 and "Use Metric" must be select on Application tab page in the LimoWiz Settings. Miles In input field now is before Miles Out on settle window. NEW: LimoWiz email engine now supports SSL (Secure Socket Layer) for secure email communications. See Settings, Email Account tab page. To be used only if required by your Internet Service Provider (ISP) or the SMTP server. Below is a sample using Gmail SMTP mail server with a fake email address. Notice the Red arrows. Fix: Double click button on Vehicles List windows (at bottom of dispatch window) to assign driver on Dispatch Window was causing an error. Fix: When drivers list was opened and inactive drivers checkbox was already selected, inactive drivers were listed. Fix: Trip Tickets did not print number passengers. Updated installation setup program. Fixed a screen drawing issue. NEW: Display OUT OF STATE Column on dispatch window. To turn on see Dispatch in Settings window. NEW: service type can have rates based on day of week. For example: Friday may have $600.00 charge. To setup see Service Type and Hourly Rates under Browse menu. Only activated when the "Based on Day of Week" checkbox is ticked on trip window. Various reports have been updated to not print luggage count when zero value is entered. Program components have been updated to latest. Inactive Drivers no longer display in drivers list. Fixed "Auto Route Line" in routing window was appearing twice for passengers. If Luggage count is 0, it will not appear on confirmations. Fixed an issue due to a side effect where AMEX was card type in credit card profile and it did not show. LimoWiz will automatically fix with AMERICAN EXPRESS when credit is viewed. When directions are blank and you update account or passenger address, a warning came to update direction. Now it will warn you only if there are directions on file. Addressed some issues when paying multiple trips from the A/R window. In some cases the pay method was incorrectly set. If you click the Pay All button on A/R window, LimoWiz also records a"TRANS" record of the "total" full paid amount. This is only for informational purposes. It does not affect reports. Displays a warning when enter a rate per hour different than the Rate After Minimum for a certain service type. Addresses an issue with email driver PDF trip tickets from the dispatch window. Account paid, unpaid report was including trips marked with X (canceled non billable). Now fixed. Audit feature is back. To turn on, see Application tab page under the Settings. LimoWiz 9.7.2 and above has an "Audit" feature to track user changes to trips like what fields were updated, deleted. This Audit file thus can grow very big, thus we added the warning when the number of records reaches a certain number of records. To clear the records, you go the Browse menu, choose Audit, enterer the starting and ending dates and click Delete button. To go back the performance, you MUST Index and PACK from the File menu! This is extremely important. In past versions of LimoWiz, the Audit feature was on by default, now it is off. You can turn it on in the Settings, Application tab page and set the number of records to warn you about. NEW: option to display trips on Dispatch window, most recent first (descending order) via a click of the mouse. NEW: option to pay multi-trips by passenger of an account, also populating account and passenger credit cards in the cards list so you can use one to pay trips with. Fixed an issue where when adding credit numbers, the wrong card was listed in the credits browser window. NEW: Added to the following to driver's profile: CDL checkbox, CDL Medical Expiration Date, Last Drug Test Date. NEW: Added # of Luggage Pieces to reservation window. This prints on trip tickets, dispatch sheets, and included in email to customers and driver's SMS. NEW: Added a new find trips by Account Contact (Reserved By) option to the Find icon on top toolbar. Fixed a rare situation when service type related settings like hourly rates and contract rates did not display on trip window. Updated the trip purge (delete) procedure to avoid an endless loop and delete all related trip information. Added "COLLECT" to Pay Methods drop down list on trip window (bottom right). Fixed an issue where pay methods were not correctly reflected in payments list. This affected payments reports. Ensure trips are correctly written to hard disk. Critical! Fixed issue with printing trip ticket immediately after adding new trip. Added payment transaction time to when posting payments. Added a warning message box on top of dispatch window when a date blocked or has an additional charge. Fixed an issue where the RTF Editor button on Terms and Condition tab page under the Settings did open an RTF file when there are spaces in the file name. Speed up some operation in LimoWiz in retrieving data. On-the-fly compression of email that is sent using the LimoWiz email engine. Size reduced by over a third. Fixed several issues reported by users in some reports and program. User defined logo (image) now appears correctly when sending HTML email. Added a warning when contract wait/time and over/time are about to change because of trip zone change. Account commission calculation can be configured under the account edit window. Also the % and amount can be changed on trip window. Pay method on payment window now correctly sets the proper code such as CA for CASH and CC for AMEX, etc. Fixed some issues with Post Auth, Issue Credit and Void on trip window when using Authorize.NET. NEW: Settlement Note on trip settle window. 100 Characters maximum. Fixed retrieval of driver payroll settings if driver was already assigned and trip not settled yet. Added: Recalculate Driver's Total Pay on Settle Window to ensure driver Total Pay is correct. Option found under Tools menu. Corrects some issues contract dates on trip window. Corrects some minor issues and Sales Contact Pay on trip window. Corrects some issues with multi-trip pay window when amount paid is less than total due. Also, fixes non printing of Discount label in trip charges. NEW: Fax using any paid Internet Fax Service like eFax, Ring Central Fax, etc. This is used in combination of PDF engine and email settings. See Fax tab page under Settings. IMPROVEMENT: Simplified Email Menu on Dispatch window. Reduced number of menu items. Fixed a few issues with Driver email via PDF. Fixed duplicate MASTER User ID records under users setup. NEW: Add multiple merchant accounts to Credit Card Account Setup. This is excellent if you have several limousine companies active within LimoWiz. NEW: Trip Settle screen has a new field of Our Company Pay. Used when farming out trips and you want to record your income. The amount is added to Yearly Sales Revenue Report. NEW: Total Pay on settled window is now a field in the reservation database whose value is calculated and saved. IMPROVMENT: Email Database compression and removing deleting records. Will be done when using Index Data Files under File menu. LimoWiz MailBox now shows attachment line when a message is opened and it can be opened by the default program. For example: PDF attachment can be opened via Adobe Reader. NEW: Color coding of car numbers on dispatch window. Each car can have its own color by modifying car profile. New Drivers Payroll Report for (all drivers) by a range of dates. NEW: Discount field name can be changed. Prints on all reports. NEW: "Use Account Address as Billing Address" prompt when adding account contact credit card information. NEW: Aging Report now has Account Name column ( Either Company Name or First Name + Last Name). NEW: Added Flat Rate field to driver's payroll settings which is retrieved when you assign a driver on Settle Window. IMPROVEMENT: Adjustment of BILL TO address on single and multi-trip invoices so they fit properly in window envelopes. NEW: Added several options to select which trip fields are included in the driver SMS message sent via email. IMPROVEMENT: Added records navigation toolbar (First, Previous, Next, Last record icons) to MailBox database. IMPROVEMENT: Company name added to Sales Contact Payroll Report. NEW: Service Type may a maximum passenger capacity and price per passenger. This checked when adding editing trips. Trip charges will updated automatically if passenger count is 1 or above. Fixed trip date issue where pop up calendar default to today's date. This occurred on trip window and dispatch window. Now it goes to the date that already entered. Intra/Inter miles for PUC reported have increased in size to allow large numbers. Also Miles window shows totals when going back to previously entered miles data. Updated Billing Window to fix some issues with billing and improve travel agent/subcontractor account commission zero out. Fixes an issue with assigning drivers on dispatch window. Updated E-Fax support via email. Make sure the sending email address account is what you have set up with E-Fax otherwise fax will not be sent. Updated dispatch window so it is maximized, the screen is drawn properly. LimoWiz now supports a new PDF creator engine called BullZip. This version is compatible with Vista and XP. This is recommended over PDF Creator. It is also very fast. Updated various option in Settings. Updated subcontractor ticket to print truncated information. News Billing Option: Use Days Aging when computing current charges. LimoWiz by default uses Month by Month Aging calculation method. - Added a checked on program startup if indexes become out of sync due to improper shut down of computer because of power outage or computer issues. - Payments line was not showing on trip window. Fixed. - Updated mail engine to reduce chances of email flagged as spam. - Updated LimoWiz main components to latest version to provide even more stability and performance. - Tooltip on dispatch on dispatch were truncated in a previous update. Fixed. - Added Drop Off Time to Driver SMS email. - Alternate field names for Pick-Up Date and Drop-Off were not used in plain text email. Now they are. - Additional minor issues addressed. - New "Hire Contract" for the United Kingdom. See Print menu. - Fixed assignment of driver and vehicles on dispatch window. Occurred in LimoWiz 9.22. Record change was not immediately visible. .
- Fixed printing of automatic credit card receipt when more than one payment is made towards a certain trip. - Fixed payroll print when only "Manual Payroll Items" are found. - Force Auth and Print CC Receipt. - Saving of Misc Charges in certain situation. - Fixed printing of 2nd blank page on contracts. 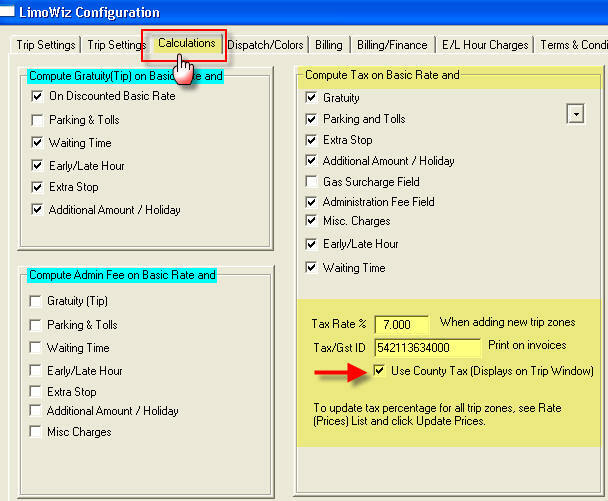 - Fixed gratuity and discount calculation on trip window when gratuity is computed after applying discount %. - Fixed an error on Settle window. - Fixed billing when using Voucher Billing. Some trips were not printing. - Fixed paying trip from A/R window when not using real time credit card sales. The payment - description was not reflected correctly. - Uses latest compiler technology. - Fixes manual gratuity input. - Accounts Payable contact phone number formatting added. - This should eliminate any numeric rounding issues due to the complex mathematical computations. LimoWiz now does NOT do any rounding of numbers. - Fixes detailed payments and some credit card encryption issues and printing of credit card receipts. - Fixes the Detailed Payment report and printing of credit card on trip tickets.